Welcome to the 2015 edition of the Merseyside Transport Trust’s annual Liverpool Buses Running Day video programme. 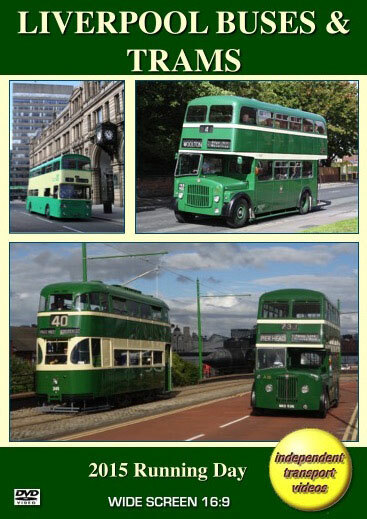 This time with a difference - this year we are featuring two Liverpool trams! Baby Grand 245 and Priestly Car 762. Starting with the buses on Sunday 13th September, our cameras set the scene with some shots of brand new Enviro 400 double decker Arriva buses running in service early in the morning at the Pier Head with the iconic “Three Graces” buildings forming a dramatic backdrop. These are part of an order for 106 new buses recently introduced to Merseyside by the company, which are mainly double deckers. Preserved action starts in Everton where we witness some of the feeder buses running through to Liverpool South Parkway (LSP) and the Pier Head to take up their duties for the day. Our cameras take up various locations around the city centre to capture the atmosphere of the day. These include the Pier Head, Tithebarn Street, St John’s Lane, Pembroke Place and Church Lane, Wavertree to name but a few. At LSP we jump on board the recently restored Ribble Leyland Atlantean 1397 (NRN 397P) for a ride to Speke Hall and back. This bus is owned by the Ribble Vehicle Preservation Trust and also features in our recently launched DVD “Ribble – Lytham Hall Running Day 2015”. On arrival at LSP we join former Wallasey Corporation 1 (FHF 451), the first production Leyland Atlantean that took to the road in 1958. Owned by “The 201 Bus Group” we sample the delights of this vehicle on a journey down to the Pier Head. After capturing more of the action here we board A267 (VKB 900), a Metro-Cammell bodied AEC Regent V back to LSP with a connection made at Penny Lane with A36 (NKD 536) the 1953 AEC Regent III recalling an event which would have happened regularly back in the day! Back at LSP we record the movements of both the preserved buses and current buses operated by both Arriva and Stagecoach. There is plenty action for you to enjoy. As usual we would like to extend our thanks to everyone involved in organising this excellent Running Day. The day before their running day, across the Mersey in Birkenhead another event took place involving Liverpool’s public transport. This was the launch of the Liverpool Corporation “Baby Grand” tram 245. It has been restored by the Merseyside Tramway Preservation Society in a partnership agreement with National Museums Liverpool and the Wirral Borough Council. 245 entered service in 1939 and ran until the closure of the system in 1957. Our cameras were on hand to record the first journeys 245 made during the afternoon. We travel as a passenger and also have a driver’s eye view of the line from Taylor Street to the Woodside Ferry Terminal. You can now find out what it was like to ride the trams in Liverpool! To make the event more authentic, the Merseyside Transport Trust supplied AEC Regents A36 and A267. We have a superb sequence showing A36 running alongside 245, recreating a scene that could have happened between 1953 and 1957! To complete the day ‘Priestly Bogie Car’ number 762 also ran in service for us to enjoy! We are sure you will enjoy this rather special video programme featuring the Buses & Trams of Liverpool in 2015.